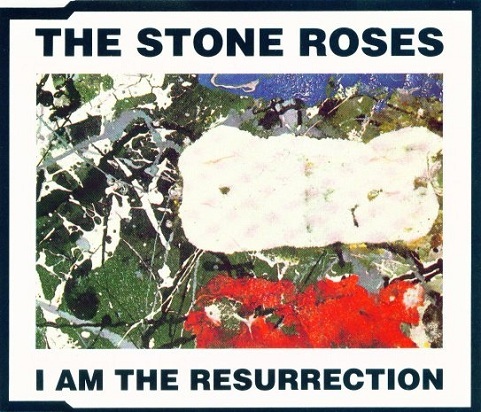 I Am The Resurrection entered the charts on 11th April 1992, spending 2 weeks in the charts and reaching a highest position of 33. A detail of the Bye Bye Badman artwork, from the Roses' debut LP cover, was used for the I Am The Resurrection cover. Where the religious artistic vision of Joy Division was shrouded with introspection and melancholy, the hedonistic 'Madchester' releases ('Hallelujah', 'I Am The Resurrection') would seek to inject an altogether more joyous, self-aggrandizing tome into their employment of biblical language. In this vein, it is unsurprising that Ian at this time was drawn toward the 'I Am' statements of Jesus (the resurrection, the true vine) in the Gospel of John. So too, in his solo career (the bread of life, the good shepherd); even the singer's solo career best of title is an Ali 'I Am'. On his arrival, Jesus found that Lazarus had already been in the tomb for four days. Bethany was less than two miles from Jerusalem, and many Jews had come to Martha and Mary to comfort them in the loss of their brother. When Martha heard that Jesus was coming, she went out to meet him, but Mary stayed at home. "Lord," Martha said to Jesus, "if you had been here, my brother would not have died. But I know that even now God will give you whatever you ask." Jesus said to her, "Your brother will rise again." Martha answered, "I know he will rise again in the resurrection at the last day." Jesus said to her, "I am the resurrection and the life. He who believes in me will live, even though he dies; and whoever lives and believes in me will never die. Do you believe this ?" "Yes, Lord," she told him, "I believe that you are the Christ, the Son of God, who was to come into the world." I am the resurrection, and the life. That is, the author of both. I am He who will at the last day raise him up; I can, therefore, if I will, raise him up now also. I am the light of the world. Through Him, we are delivered from the power of darkness. Whoever follows me will never walk in darkness, but will have the light of life. 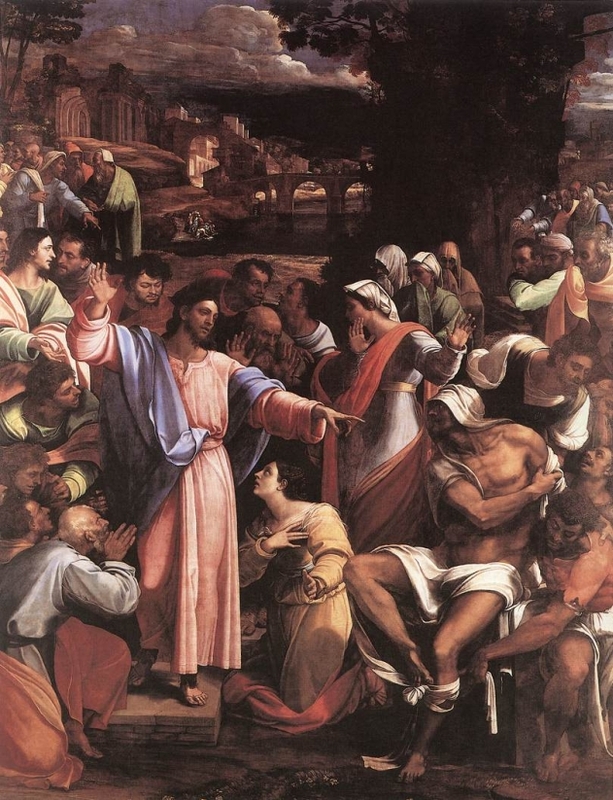 Top right: 'The Raising of Lazarus' (1517 - 19) by Sebastiano del Piombo (c. 1485 - 1547). To men indeed he was dead, but to God he slept. For the Almighty as easily raised him from his grave, as man can raise the slumberer from his bed. Jesus restores Lazarus to life four days after his death, a precursor to His own death and Resurrection. 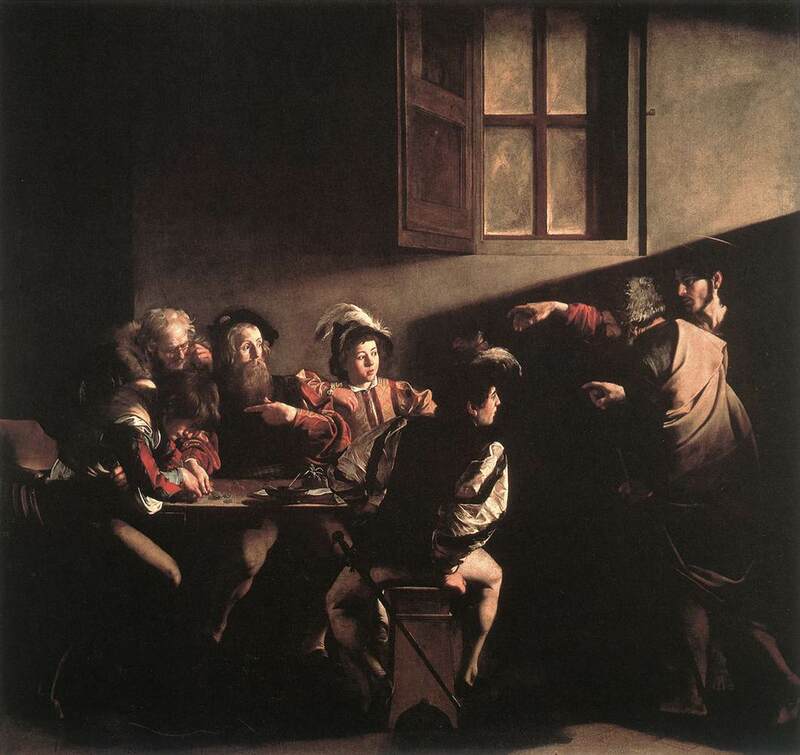 In the background, the Pharisees are depicted plotting Christ's arrest. In the Synoptic Gospels, it is the Clearing of the Temple that finally seals Jesus' fate (Mark 11: 18). In the Gospel of John, who has the Clearing of the Temple in 2: 13, it is the raising of Lazarus. From this point on, and as the fateful Passover Feast draws near, events move quickly, and the Anointing at Bethany (12: 1 - 11) is a symbolic pre-burial exercise. Bottom: 'The Resurrection' (c. 1460) by Piero della Francesca (c. 1415 - 1492). 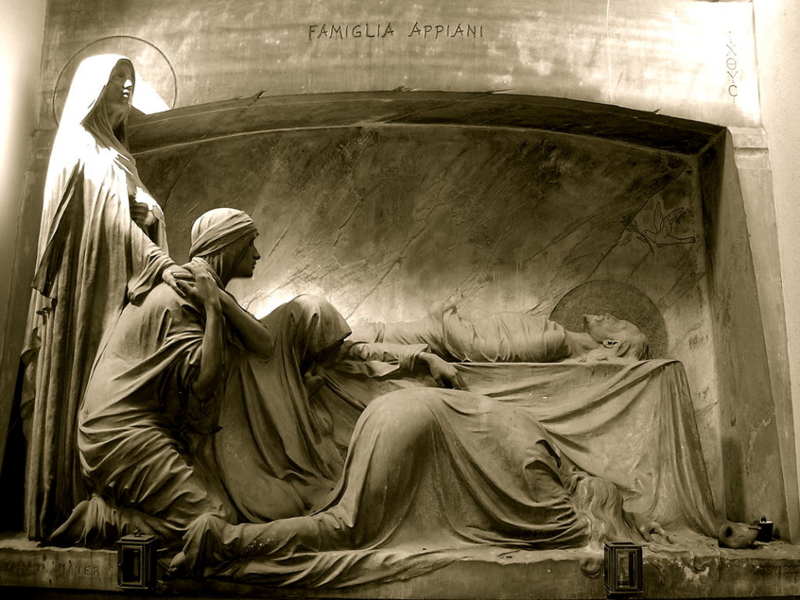 From now on, what seemed to be the absolute and final end - death - was seen as a new beginning: Resurrection. 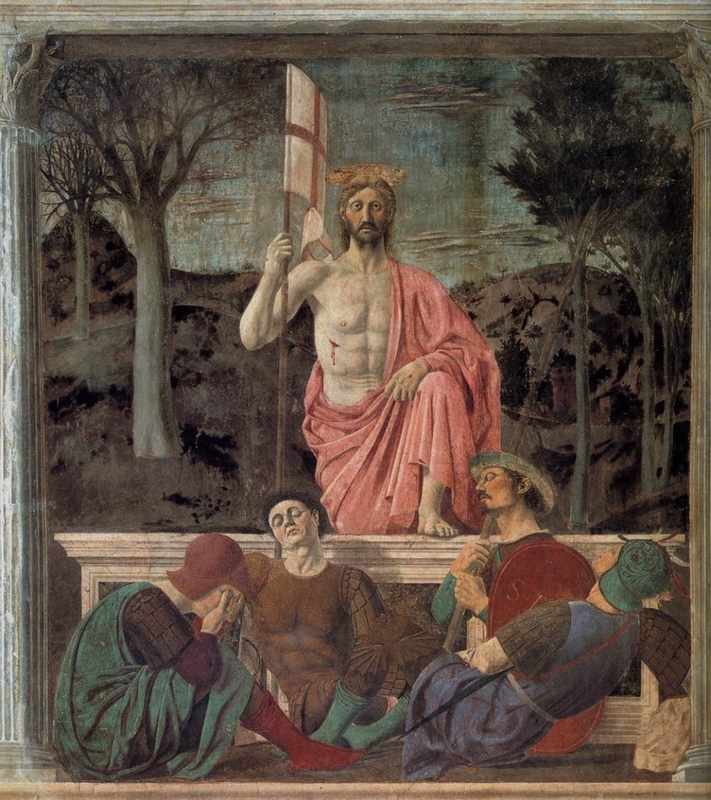 Jesus dominates the centre of the composition, portrayed in the moment of His Resurrection, while underneath are four sleeping soldiers. The landscape, immersed in the dawn light, has symbolic value: the contrast between the flourishing trees on the right and the bare ones on the left alludes to the renovation of Man through the Resurrection's light. According to tradition, the sleeping soldier in brown armour is a self-portrait of Piero; his head symbolically makes contact with the pole of the Guelph banner carried by Christ. "But Rabbi," they said, "a short while ago the Jews tried to stone you, and yet you are going back there ?" Jesus answered, "Are there not twelve hours of daylight ? A man who walks by day will not stumble, for he sees by this world's light. It is when he walks by night that he stumbles, for he has no light." An expressed desire by Jesus to be alone (line 6 of the opening verse) is a common occurrence in Scripture. For example, Luke 5: 16 states, "But Jesus often withdrew to lonely places and prayed." I Am The Resurrection applies biblical language in the context of a human relationship, and is described by Squire as "a murderous attack on one individual, I don't want to tell you who it is. It's someone both Ian and I know." There are flashbacks to Eden and the three temptations of Jesus in the rebuking quality of the lyric. Left: In a cringeworthy 'modernisation' of the Passion narrative, I Am The Resurrection was used by the Brussels Broadcasting Corporation as the climax for the 'Manchester Passion'. 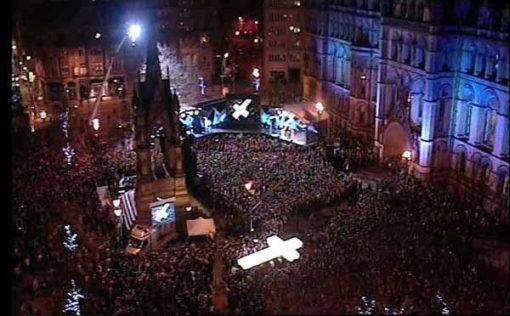 This was a public performance of the Passion, in which the last hours of Jesus' life were retold using a backdrop of contemporary Manchester music. The majority of I Am The Resurrection was sung by Peter (played by Nicholas Bailey) after the arrest of Jesus, with the chorus line being sung by Jesus (played by Darren Morfitt). The event took place on the streets of Manchester, airing live on BBC Three on Good Friday, 14th April 2006. 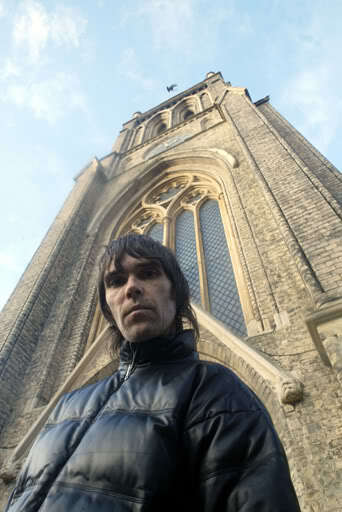 Ian Brown was rumoured prior to the play to be performing in some capacity, or appearing, but did not appear. The cast were as follows: Presenter/Pontius Pilate - Keith Allen; Peter - Nicholas Bailey; Judas Iscariot - Tim Booth; Jesus - Darren Morfitt; Mary - Denise Johnson; Barabbas - Chris Bisson; Criminal in van - Bez; Himself - Anthony Wilson. Among the other songs performed were 'Heaven Knows I'm Miserable Now' (The Smiths), performed by Judas Iscariot as he betrays Jesus, Cast No Shadow & Wonderwall (Oasis), Love Will Tear Us Apart (Joy Division); Sit Down (James); Blue Monday (New Order) and Hallelujah (Happy Mondays). 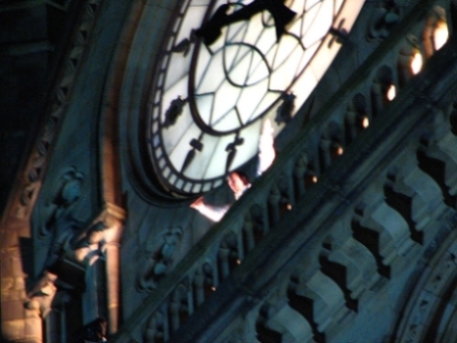 Right: 'Jesus' (played by Darren Morfitt) sings I Am The Resurrection at the top of the Town Hall. "I Am The Resurrection, for example, started out as a reverse bass piss-take of Paul McCartney on Taxman. Mani used to play that riff every day, I'd come in and John would doodle some Fender over the top and we'd do it for a laugh at soundchecks. Finally we said, "Let's do it properly - this joke song actually sounds really good !" 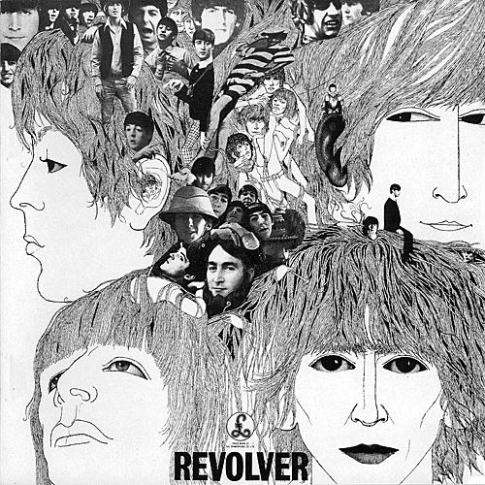 Left: Revolver (August 1966) by The Beatles. The genesis of I Am The Resurrection is to be found on this album. Revolver showcased a number of new stylistic developments which would become more pronounced on later albums. The Beatles' unfolding innovation in the recording studio reaches its apex with the album's final track, 'Tomorrow Never Knows.' This track was the most radical departure from previous Beatles' recordings, with its skeletal bass/drums propulsion enhanced only with tape loops, backwards guitar and Lennon vocal. The malevolent tone of the lyric, "You're a no-one, nowhere washed up baby who'd look better dead", is evocative of 'Run For Your Life': "Well I'd rather see you dead, little girl than to be with another man. ", from the Rubber Soul LP. Lennon later admitted to stealing this lyric from 'Baby, Let's Play House' by Elvis. The influence of The Beatles runs, unsurprisingly, throughout the Roses' work. During some of The Stone Roses' 2012 reunion shows, Squire would fluidly drop in riffs of his influences in his performance; in the space of half a minute on Fool's Gold at Heineken Music Hall, Amsterdam (12th June 2012), the guitarist gravitated from 'Day Tripper' to 'Le Freak' by Chic (accompanied by a point-to-the-sky Saturday Night Fever disco move from Brown). Squire was perhaps prompted in this direction by compatriot Johnny Marr, who joined Nile Rodgers on stage at the Warehouse Project, Manchester, on 12th November 2011, for a rendition of 'Le Freak'. During the soundcheck at Les Nuits des Fourvi�res, Lyon (25th June 2012), Ian ran through an a capella version of 'Michelle' by The Beatles, a love ballad from Rubber Soul. The words and style of 'Michelle' have their roots in the popularity of French Left Bank culture during Paul McCartney's Liverpool days; it remains one of the most popular Beatles songs in France. 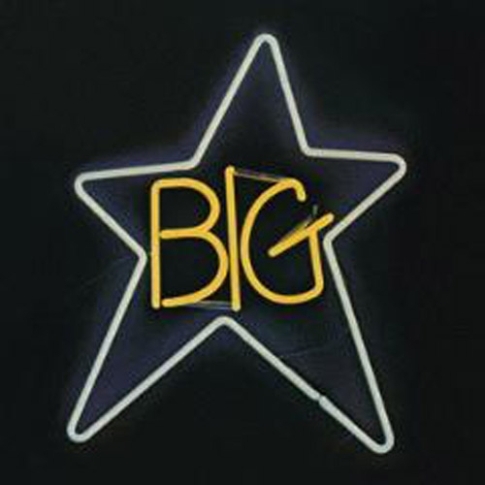 Right: '#1 Record' (1972) is the debut album by the American group, Big Star. "We had some bits left over on tape which we just dropped in at exactly the right point - that little rhythm guitar bit at the end. Also the acoustic jangly stuff on the end section, too; I'd recorded it on this little Philips ghetto blaster and I got the engineer to drop it in. It's a bit out of time, because we were just pressing Play to try and get it in sync. I think we did only try it twice, so it's a bit out of time. I like it, though." 'I Am The Resurrection' was Ian's line and I wrote all the bitter, twisted, revenge verses to that song." "We shared writing the lyrics. Adored is all me, She Bangs The Drums is half and half, I did the verses, he did the chorus, Waterfall - John did most lyrics on Waterfall, Don't Stop is about fifty-fifty, Badman about fifty-fifty, Elizabeth My Dear I wrote, Made Of Stone I wrote 90 percent, Shoot You Down we both wrote, This Is The One I wrote, Resurrection I wrote." 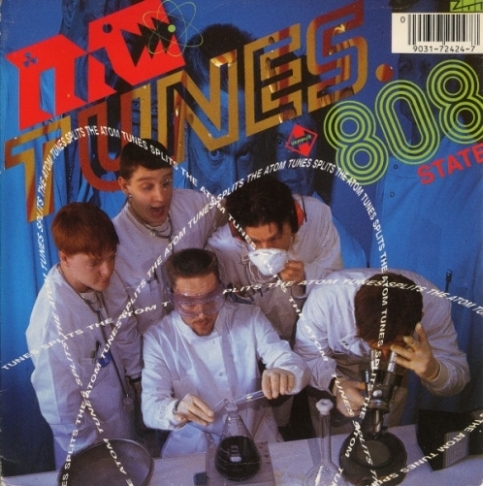 The bassline from I Am The Resurrection was sampled by MC Tunes vs 808 State on 'Tunes Splits The Atom' (1990). 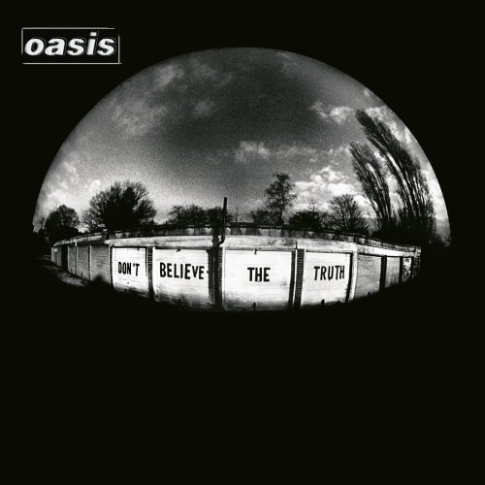 The influence of I Am The Resurrection's coda is strongly evident on 'Keep The Dream Alive' by Oasis, from 'Don't Believe The Truth' (May 2005). Put these in alphabetical order, like a scale, and you get this. This is the B mixolydian scale. It is the 5th mode or rotation of the E major scale. Notice they have the same notes. The mixolydian sound is not actually confirmed until the A major chord, as the song could be initially thought of as being in the Key of B major (Ionian mode). The reason for thinking it could initially be in Ionian mode is because the B major chord is common to both B Ionian and B mixolydian keys. Also the absence of the A or A# note in either the vocal melody or Bass line over the B major chord. Check to see the difference between the 2 scales. You will see they only have one note difference, the A and A#. You might notice there is no D# note in there. So you're looking for a scale that has a B note, a D# note and be able to construct an E min chord as well. So you could add the notes of that chord Emin = E G B. None of the modes of the major scale work over this one. So you have to check the other scales, i.e., Harmonic and Melodic Minor and their respective modes. To give you some more idea of when it is Dorian and when it is Mixolydian, here is a breakdown in terms of the cd times. During the first part of the solo, Mani uses the D# note occasionally which could be said to be from the B Mixolydian mode. However, because of the more frequent occurrence of the D note, this leans things more towards the B Dorian mode. Also, because there are no chords being played here, the tonality is merely implied by the melodic instruments (guitar and bass). So theoretically they could change the mode by altering one note and then change back again. And in this case it sort of does that. Although because of the main tonality being B Dorian, the D# note would be viewed as a passing note or added note to the B Dorian mode. This is my all time favourite bit of guitar playing. In the same token it is also the hardest bit to explain theoretically. This is where it changes between the two modes quite a bit more. There is some more chord playing here. We have a B major chord played by Squire and the notes B and A being played underneath by Mani. This is B Mixolydian because of the D# note in the B major chord. Although whenever Squire comes away from the B chord and plays lead, he tends to play notes from the B Dorian mode. At 04:48 the chord sequence goes B major, D major/A (this just means a D major chord with an A bass note, and an E major chord). So whenever he plays the B major chord, it is B mixolydian, but when it goes to D major/A and E major, the notes seem to be taken from the B Dorian mode. After the stop it seems to sit on the B major chord with Mani doing the B and A notes, implying B Mixolyian again. At 06:01 it shifts back into B Dorian for the lead break. We see the D note pop up all the time by Squire over the B, A and E bass notes by Mani. This implies the B Dorian mode. At 06:17 it shifts back to B Mixoldian until the end of the song over the chords B, A and E major. 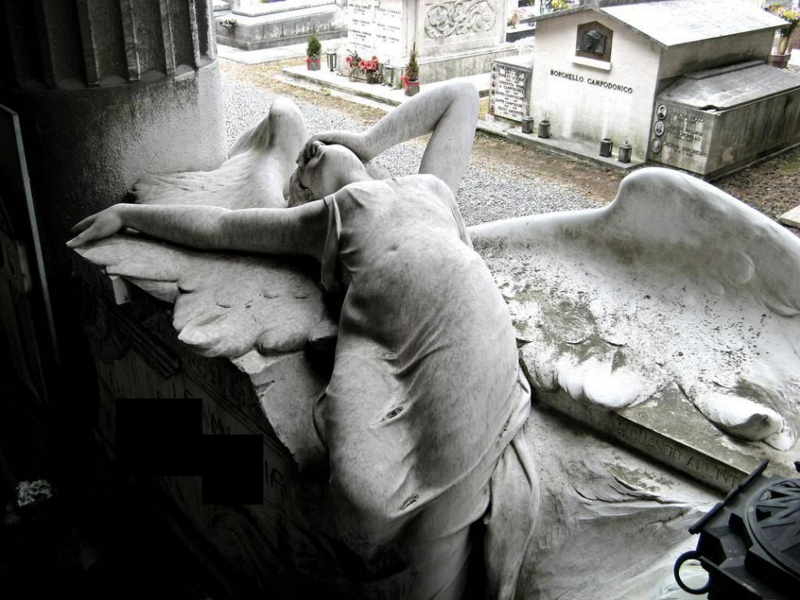 Left: I Am The Resurrection CD front cover. 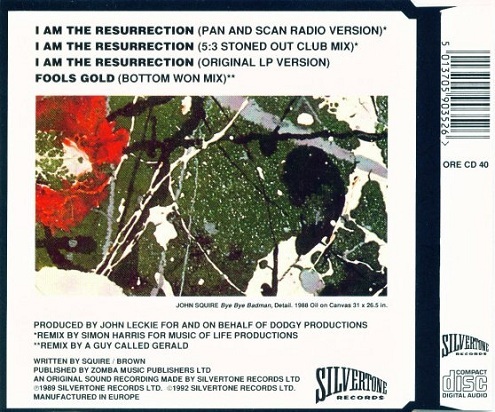 Right: I Am The Resurrection CD back cover.